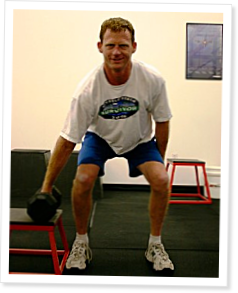 The health lift, known more commonly as the deadlift, is the most basic of essential movements. If an athlete were to do little more than deadlift they would most certainly stay very functional and possesses good strength. I view the deadlift as a sign of vitality and independence. The simple task of squatting to the deck and picking up an implement represents baseline functionality. When someone can no longer squat and pick up their belongings, their independence is gone. Deadlifting is traditionally executed straight on; facing the bar/dumbbell/dog food/landscape mulch, but deadlifting an object at the side is a different and equally useful skill. It can involve just about any object with a handle. Those living in rural areas or raised on a farm are accustomed to picking up their stuff and moving by foot to the destination. Suitcase deadlifting with two objects allows for greater overall load and trains the grip and shoulder girdle stabilizers simultaneously. However, suitcase deadlifting is actually easier to manage with two objects, assuming the loads are reasonable, than with one. The counterbalancing of the loads reduces the stabilization requirements. This is why my suitcase deadlift workouts generally involve one dumbbell.